Jonathan Crabtree and Christopher (Cal) Lee to present workshop on “Introduction to Data Curation”. The CyVerse discovery environment handles the technology of collaborative research so researchers can focus on the science. As part of their outreach/educational activities the DFC has developed a video to introduce potential new users to the DataNet Federation Consortium. Hao Xu presented on “Bidirectional Integration of Multiple Metadata Sources” at the iRODS User Group Meeting, June 9. Mike Conway presented on “CyVerse Discovery Environment and Cloud Browser” at the iRODS User Group Meeting, June 9. Participants will see machine actionable rules in practice and be introduced to an environment where written policies can be expressed in ways an archive can automate their enforcement. Essawy, B. T., J. L. Goodall, H. Xu, A. Rajasekar, J. D. Myers, T. A. Kugler, M. M. Billah, M. C. Whitton, and R. W. Moore (2016), Server-side workflow execution using data grid technology for reproducible analyses of data-intensive hydrologic systems, Earth and Space Science, 3, doi:10.1002/2015EA000139. A recent CyVerse Webinar (March 25) provided an introduction to Docker technology and how to use Docker to bring tools into the Discovery Environment. Reagan Moore has developed an on-line course on policy-based data management. The material for this course was developed through the DataNet Federation Consortium for three audiences: masters students at the School of Information and Library Science (SILS) at the University of North Carolina at Chapel Hill (UNC-CH); academic partners of the DFC federation hub; and users of the integrated Rule-Oriented Data System (iRODS). The iRODS middleware is a policy-based data management system that is used internationally for the management of distributed data. Please click the link to view the course workbook, videos, rules, slides and syllabus. Then in the menu on the left of the browser click on the folder of choice for a list of downloadable files. DFC poster recently published on ESIP Commons. iPres 2015, the 12th International Conference on Digital Preservation, selected “Preservation Policy Toolkit” as best paper. The DataNet Federation Consortium uses a policy-based data management system to apply and enforce preservation requirements. This paper describes the Preservation Policy Toolkit developed by the consortium. In particular, the paper describes the infrastructure needed for preservation, presents examples of computer actionable forms of policies, and provides a generic template for designing actionable preservation policies. The Royal Swedish Academy of Sciences has announced that T2K collaboration member Takaaki Kajita will be awarded the 2015 Nobel prize in physics. Prof Kajita, Director of The Institute for Cosmic Ray Research (ICRR), University of Tokyo, shares the award with Prof Arthur McDonald (Queen’s University, CAN) “for the discovery of neutrino oscillations, which shows that neutrinos have mass.” The T2K experiment has used iRODS since 2010. This has been described in a paper, “First iRODS Experience in a Neutrino Experiment” presented at the 2011 iRODS user group meeting. The Research Data Alliance Outputs include a report of the Metadata Standards Working Group (Jane Greenberg, Co-Chair). The Metadata Standards Working Group report is found on pages 16-17 of the RDA Outputs document. The Research Data Alliance Outputs include a report of the Practical Policy Working Group (Reagan Moore,Co-Chair). The Practical Policy Working Group report is found on pages 10-11 of the RDA Outputs document. The iRODS consortium recently posted information on installing Cyberduck. 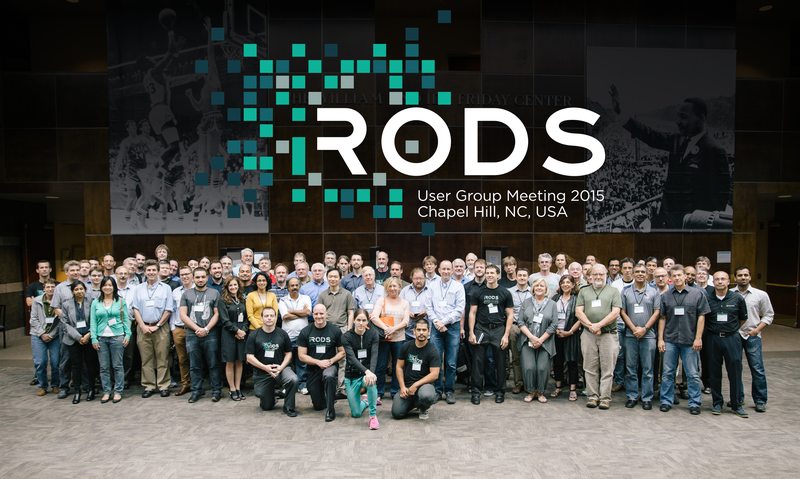 The iRODS User Group Meeting 2015 was held at the William and Ida Friday Center in Chapel Hill, North Carolina, Wednesday, June 10th and Thursday, June 11th, 2015. More than 90 participants from eight countries attended the iRODS User Group Meeting. Registration is open! 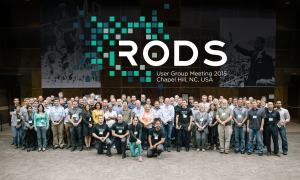 The iRODS User Group Meeting 2015 will be held at the William and Ida Friday Center in Chapel Hill, North Carolina, Wednesday, June 10th and Thursday, June 11th, 2015. Jane Greenberg presented on the topic of “Assigning Metadata: A Key Responsibility in Enhancing Discovery of Research Data” at the NFAIS Hybrid One-Day Worskhop (Mastering the Curation, Integrity and Citation of Quality Research Data: Research Data Publication, Part II). Jane referred to DFC, HIVE and noted the current work in materials science. Attendees at the 2014 Research Data Access and Preservation Summit (RDAP14) heard an update on the DataNet project, funded by the National Science Foundation (NSF) and designed to bring together data research infrastructure organizations to support digital preservation, access, integration and analysis. CCI’s Metadata Research Center (<MRC>) advances research in metadata, semantics and ontologies. Current <MRC> research initiatives target digital data, data-at-risk and knowledge organization via leadership and engagement in Dryad, two HIVE DataNet Federation Consortium collaborations, the DCMI Science & Metadata Community, the DataONE/Preservation & Metadata Working Group and the CODATA/Data-at-Risk Working Group. Jane Greenberg is the MRC Director and Drexel University Professor. GABBS to collaborate with the DataNet iRODS project. Libraries and command-line scripts for performing ecohydrology data preparation workflows. iPlant Collaborative News: The iPlant Collaborative at the University of Arizona’s BIO5 Institute hosted a three-day hackathon session for the iRODS Consortium. Digital Curation Center News: Mary Whitton presented an update on DFC including a description of “What our users want”. UNC School of Information and Library Science News: The Assembly of the Federation of Earth Science Information Partners (ESIP Federation) elected four new member organizations, two of which have an affiliation with the University of North Carolina at Chapel Hill’s School of Information and Library Science (SILS), bringing total membership to more than 140 organizations. Ryan Steans from the Texas Digital Library described organization and management plans for a regional digital library. Peter Wittenburg represented the European Union Data Infrastructure and discussed organization and strategy for building a data grid. Suzie Allard of the NSF DataOne project presented on the organization and management for registering and accessing distributed collections. Dave Fellinger from Data Direct Networks, talked about integration of collection processing into the storage system. Carol Beaton Meyer of Earth Science Information Partners discussed building community consensus on data sharing. Aletia Morgan from Rutgers University Community Resource detailed implementing an institutional repository. Reagan Moore of the NSF Datanet Federation Consortium closed the presentation with discussion of implementing a community-based collection lifecycle. The Daily Tar Heel: Researchers in the School of Information and Library Science have become part of a multi-million dollar effort to create a national data network. Plans for the infrastructure are in their earliest stages, with researchers saying they don’t know exactly how far their research could take them. “The significance of the grant is bigger than the actual monetary award as it position’s Carolina as a leader in data management,” said Karen Green, communications director of the Renaissance Computing Institute, which will be involved in the research. RENCI News: The National Science Foundation has funded the University of North Carolina at Chapel Hill to lead a multi-institutional team that will build and deploy a prototype national data management infrastructure that addresses some of the key data challenges facing scientific researchers in the digital age. The infrastructure will support collaborative multidisciplinary research through shared collections, data publication within digital libraries and reference collections within persistent archives.